Gifts are meant to be given from the heart and corporate gift giving is no different. It’s all too easy to think “what’s in it for me” when we give a gift to a customer or client instead of “how can I make it special for them. During our 14 years assisting our customers, throughout the world, choose appropriate gifts, we have come up with some tips that should be helpful to you as well. Creativity is necessary when the budget is low. An inexpensive gift can be given an elegant touch with gift wrap, a spectacular bow, or even an unusual box or container. Tailor your gift to the recipient. Build a personal relationship with your customers, if at all possible, and learn what they enjoy doing in their spare time. A woodworking fanatic may like a gift certificate to a hardware store while a football fan may be enthralled with a pair of tickets to his/her favorite team’s game. Think quality, quality, quality. Stay away from gifts that look cheap. Inexpensive gifts can be quality gifts. Avoid alcohol. This used to be the “gift to give” but is now considered inappropriate by many. There are those who don’t drink and also those who shouldn’t drink. A gift that is functional, but that the recipients may not buy for themselves, is always appreciated. If giving to an international client, be aware of gift protocols and taboos for their particular culture. When choosing a gift think of perceived value, not actual value. Unless you send the receipt (which would be incredibly tacky), they’ll never know how much or how little you spent. See suggestion #1 for ideas to increase the perceived value of a gift. Even though you may not know the customer very well, make the gift personal by writing a note to go with it. The fact that you took the time to sit down and write can mean a lot. When choosing large-volume corporate gifts, consider a gift that reflects your company’s spirit and brand. But be sensitive about using your company logo on all your gifts–particularly those which will be used in the home. Would you entertain with coasters or cups that had a company’s logo imprinted on them? Maple Ridge Farms ,which is rated as the #1 supplier of corporate gifts every year, uses very tasteful imprints of your company logo on the product or ribbon. 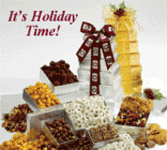 Chocolates make great gifts but, once they’re eaten, they’re gone and the box is usually discarded. If giving chocolates, consider combining them with a gift that will be kept such as a crystal bowl. Just as chocolates are forgotten as soon as they are eaten, so are gift cards forgotten as soon as they are spent. If giving a gift card, combine it with something else that will be memorable. If the gifts are for employees, give gifts that they will enjoy on their off time rather than work related gifts. A picnic basket, game, or even a gift basket that reflects their personal interest are some suggestions. If your budget is too low for even a small gift, send a gorgeous card that you selected along with a personal note telling the recipient how much he/she is appreciated. A gift that represents your own unique region of the country is usually appreciated. This shouldn’t have to be said, but avoid any gifts that are political, sexual, or religious in nature. Don’t just think holidays. Create occasions for gift giving that are unexpected. Some reasons to give a gift include congratulations, celebrations, motivation, promotion, thank you, cheer up, and apologies. If your company has a predictable gift that you want to give, transform it into an exciting gift. For example, a silver picture frame could include a message just from you inserted in the frame. Or a coffee mug could include some gourmet coffee and cookies. A glass candy jar could be filled with gourmet candies or cookies. Take time to gift wrap a gift. This conveys the message that you care. Think about the recipient’s taste and style, rather than yours, when choosing a gift. Perhaps you’re country-western while the recipient is sophisticated. Choose a gift that would appeal to him or her. Some corporations and government agencies have limits on the value of a gift that is given to their employees. Others may not allow gifts at all. Check these policies to avoid embarrassments. Corporate gifts are business tools to strengthen relationships. Make sure that the gift reflects positively on you and your company. Keep a few carefully-chosen gifts on hand so that you can show your appreciation on the spur of the moment. Most important of all is to be sincere when you give a gift. Enjoy the spirit of giving. 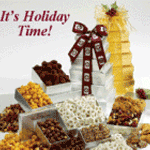 If you are looking for corporate gifts to send to your customers and clients, check out Maple Ridge Farms. They have been voted as the #1 Corporate Gift Company by promotional distributors for many years.